Antique windmills that watered the plains of Oklahoma during the pioneer and territorial days are on display at the Shattuck Windmill Museum and Park in northwestern Oklahoma. By some museum standards, Oklahoma’s impressive assortment of small museums that dot the landscape may seem insignificant, but these little gems offer up fascinating collections. Speaking of geology, the Conoco Museum in Ponca City is one of the newest kids on the museum block and rocks an interactive bonanza with 19 flat-screen televisions, computer touch screens and a 40-seat movie theater. Exhibits trace the story of the world-renowned company from its wildcat days in the Cherokee Outlet to international energy empire. Tap into a mother lode of Western history at the Fort Sill National Historic Landmark & Museum in Lawton. Established in 1869 by General Phillip Sheridan of Civil War fame, Fort Sill was once regarded as one of the most beautiful posts in the West. A number of celebrated Western folk left their mark here: the colorful Wild Bill Hickok and Buffalo Bill Cody served as scouts at the fort; the renowned Comanche chief Quanah Parker surrendered here; and Chiricahua Apache leader Geronimo came to Fort Sill in 1894. The ultimate in kitsch and hip pop culture, the Toy and Action Figure Museum in Pauls Valley, appeals to the kid and superhero dreams in all of us with 10,000 action figures, interactive hands-on areas, toys, memorabilia and behind-the-scenes toy news and info. Named as one of Time Magazine's "Top 50 Most Authentic American Experiences," from Batman to Star Wars to the "Collector's Bedroom," an area where literally thousands of action figures fill every inch and are said to come alive each night, the ideas and fun in this museum are anything but small. Trek on over to the fast track of Oklahoma’s land runs at three Cherokee Strip museums located in Perry, Enid and Alva. If archeological history is your thing, you’ll want to dig into the treasures at the Museum of the Red River in Idabel or Spiro Mounds in Spiro. You’ll get a glimpse of Woodward’s boisterous past at the Plains Indians & Pioneers Museum with its compelling exhibits on pre-history hunters, Cheyenne and Arapaho Tribes, and homesteaders. 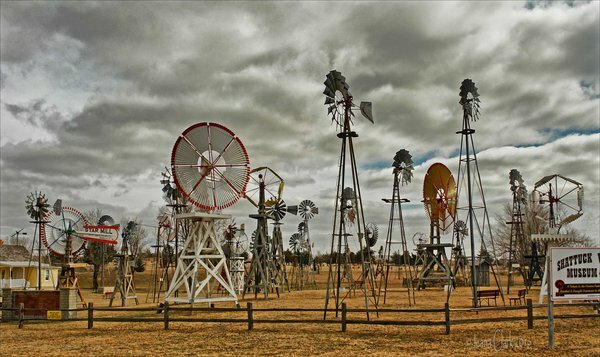 The Shattuck Windmill Museum & Park takes vintage windmills seriously – 51 of them cast a windy spell in this captivatingly sweet high plains park. Another great star from early film days, Tom Mix, is honored with the Tom Mix Museum, in Dewey. Although Mix was originally from Pennsylvania, he became the first marshal of Dewey in 1912, and later appeared in more than 300 Western movies from the 1920s until his death in 1940.